On January 5th, our original story uncovering the many candid and controversial details of matters inside Sega by former SoE staffer Ben Andac caused global uproar and concern surrounding the state of Sonic and of Sonic Team. It was read many times over by hundreds of thousands throughout the gaming community in various forms. 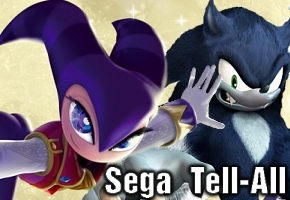 Now, more than four months later, the Sonic Team’s Tetsu Katano–aware of our story and its ramifications–makes his first public comments on the story. The bottom line, in his view–that was then. This is now. Speaking to an inquisitive Adam Doree of Kikizo Games, Katano, who has been involved with nearly all major Sonic titles of the past decade, attempted to play down Andac’s comments by noting that, in its current state, there’s plenty to be excited about with Sonic Team. Obviously, I’m aware that some people lose their inspiration and motivation in making games. But each person has his or her own view about their work. For me personally, I simply enjoy making games, and that’s what I wanted to do when I joined Sega and Sonic Team. As a professional game creator, you have to always be thinking about new ideas and concepts for games, and we have a lot of new people with fresh ideas and attitudes coming in every year. So as a team, we have good vibrations, good momentum. Katano’s comments show that the team is taking in new talent on a regular basis. While that’s a good thing in the sense of keeping Sonic Team fresh, it’s also PR speak in some circles that indicates other talent has been let go, perhaps often. Though that doesn’t quite give the Sonic Team environment the “sweatshop” label Andac proposed, such moves yield a “rotating door” label, and that may not be good for overall quality. Now that you’ve heard both sides of the story, we want to know which side you believe more–the past musings of Ben Andac, or the current take from Tetsu Katano. We have a poll asking that very question, and you can also tell us in the comments area below.